He counseled that we can’t have protected species/areas, while our young men remain endangered species. Bert Tucker’s vision and writing lessons encompass his legacy to Belize which will continue to illuminate the pathway ahead through generations as we hold on to our patrimony. He declared the Belize Public Meetings hundreds of years ago in our country, as one of the earliest rudimentary example of democracy. Bert’s favourite reflections was “At the confluence where all the rivers meet, you’ll find me at the Zambezi” Bert believed we must work like the productive wee-wee ants collectively instead of the individual me-me attitude in people. Belize, Our Common ground to Sanctuary. On his final journey to the banks of the Zambezi, shoulder to shoulder with his, compatriots, this Renaissance Man, Adalbert Tucker marches to the music of his favorite Jazz saxophonist, John Coltrane and his song "Wise One". A Wise One has passed on our Renaissance Man! now we Listen to his voice as he speaks from the Zambezi. Adalbert “Bert” Tucker, Belize’s Ambassador for Foreign Trade in the Ministry of Foreign Affairs and Foreign Trade, famously known for his activism for the community-based project, the Belize River Valley Development Program (BELRIV), passed away last Thursday in Jamaica after his battle with prostate cancer—one of the leading cancers among Belizean men and the ailment which recently claimed the life of another well-known Belizean, attorney Lionel Welch. Belize’s Honorary Consul in Jamaica, Elecif Arthurs, told Amandala this morning that Tucker will be buried in Belize and they are in the process of registering his death and preparing the body for burial within the next two weeks. The Ministry of Foreign Affairs, she said, will make a formal announcement. Tucker had recently traveled to Jamaica to seek treatment for his condition, but his condition was reportedly too far advanced. Tucker is a former United Nations Advisor to several countries in the Caribbean and Africa. He is a graduate of the University of the West Indies and Harvard. When he was appointed as Foreign Trade Ambassador in 2008, National Assembly Clerk Eddie Webster said that Tucker brought to the table a unique mixture of national and international experience. “He has worked at the UN for the advancement and development of the human race, the rights of women and children. He worked in a number of the trouble spots across the world, especially in Africa and in the Caribbean. “In Belize, he was the founding member of the Isaiah Morter organization. He pioneered the development of the BELRIV ‘OASIS,’ and for me, that is where we actually met”, Webster said. 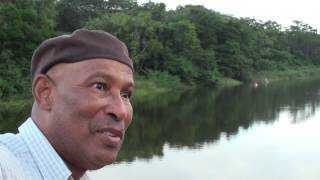 Tucker was the leading advocate for the work of Henry C. Fairweather, the “Mahogany Man,” in his mission to reclaim Belize’s mahogany legacy by the replanting of trees in the BELRIV area. Bert Tucker was a world class technocrat and scholar. After acquiring a Master’s degree in Economics from the University of the West Indies, he later did post-graduate work in law and international relations at Harvard, the United States’ most prestigious university. Bert worked in international development as a consultant/adviser for three decades in fourteen countries, including Jamaica, Grenada, and Namibia. It is because of his involvement in the rebuilding of Jamaica during the Michael Manley era, the rebuilding of Grenada during the Maurice Bishop era, and the rebuilding of Namibia during the era of SWAPO (the Southwest Africa People’s Organization) that Bert Tucker became iconic in anti-imperialist circles in Belize and the region. During the periods when he worked in those three countries, they were virtual war zones, so it is for sure that Brother Bert was a brave warrior. It is a disappointment to me that, to the best of my knowledge, he never published written material about his experiences in those important revolutionary situations. Over the years there were several occasions on which we spent time together in lengthy conversations. This was a brilliant and extremely witty man. He had been many places and seen many different things. It was always a pleasure to sit with him. Bert was very much a Caribbean man. It seems to me that he was working in the public service here when he got an opportunity in the later 1960s to travel to Jamaica for higher studies. He fell in love with Jamaica, I think, and Jamaica became his door to the world. Bert was three plus years older than I. When I got a break as a teenager to travel to the United States in 1965 for higher studies, Bert and his young wife were living in an alley on West Canal practically next door to my family home on #1 West Canal. On several occasions, Bert and I shared our separate happy memories of “Empty Chair,” the Keith Lyn hit that ruled the canalside the night of my farewell party. I got a break in life. Bert Tucker made his break, and became world class in his areas of specialization. I give him great respect, and mourn his untimely passing. There was so much more he had yet to give Belize. I extend my deepest condolences to my brother’s family and friends.